'Jurassic World: Fallen Kingdom' is the sequel to 'Jurassic World' (2015) and is the fifth installment of the Jurassic Park film series. Cast: Chris Pratt, Bryce Dallas Howard, Rafe Spall, Justice Smith, Daniella Pineda, James Cromwell, B. D. Wong, and Jeff Goldblum. It's seldom that a summer blockbuster is able to have a truly visceral impact when so many modern action films have become consumed by their own relentless cacophony. Director J.A. Bayona (A Monster Calls, The Impossible, The Orphanage) has delivered a wonderfully paced blockbuster which builds up the tension and suspense along with exhilarating action. The movie begins with brilliantly shot introductory scene and ends on a terrific note, resulting in one of the most gratifying and euphoric Jurassic Park film. After the events of 'Jurassic World', the dinosaur park is long gone and now Isla Nublar is home to an erupting volcano that threatens to wipe out the existing dinosaurs. Claire Dearing (Bryce Dallas Howard) desperately wants to save the creatures from extinction. She’s contacted by Eli Mills (Rafe Spall), who works for billionaire philanthropist Benjamin Lockwood (James Cromwell). Lockwood wants to save the dinosaurs, and has created a secret island sanctuary where they can live in peace. But to pull off the secret rescue mission, Mills asks Claire to bring in Blue’s trainer, Owen Grady (Chris Pratt). But soon this seemingly noble rescue mission goes horribly awry. Bryce Dallas Howard in the still from the film. Without any doubt J. 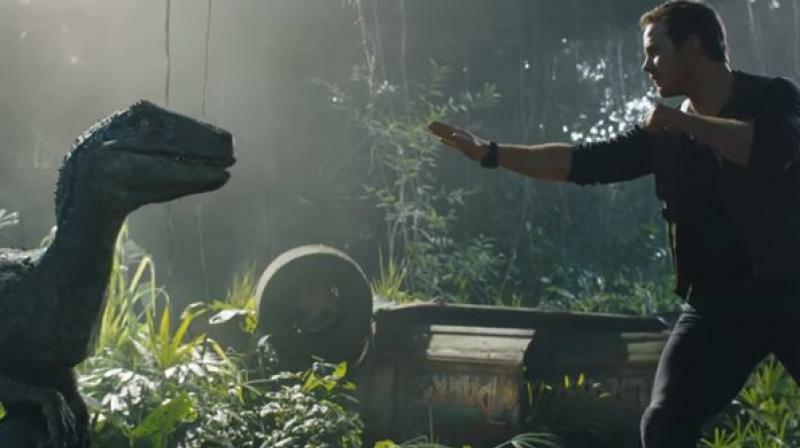 A. Bayona's 'Fallen Kingdom' offers a massive impact into live-action monster movie. He is master at building the tension and creating atmospheric unease. The film provides many jaw-dropping moments with some really good scares, that is hard to find in any typical movie. The volcano destruction sequence is finely captured and all the relentless action thereafter makes for a delicious visual treat. Credit should also be given to visual effects department. The dinos, especially the raptor attack (Blue), is superb. The dinos look great, thanks to Andy Nicholson's remarkable production design. Cinematography by Óscar Faura is terrific too and it provides several iconic moments that you would expect from the franchise. That said, the major flaw from this movie is, the dinos (barring Blue) lack the real personality. The most baffling thing is to see T-rex's very little presence on the screen. Also, the human characters have a very clichéd arc and the sub-plot with a little girl feels bit contrived. These characters are quite bland and thinly written so the actors have nothing much to do but look scared and run around, making it difficult to actually root for them. However, at least the clichés are taken advantage of, with some good suspense built around and throwback to the original films. It's because of Bayona's smart direction and the acting performances, things don't go completely haywire. 'Jurassic World: Fallen Kingdom' is the second installment of a planned Jurassic World trilogy. 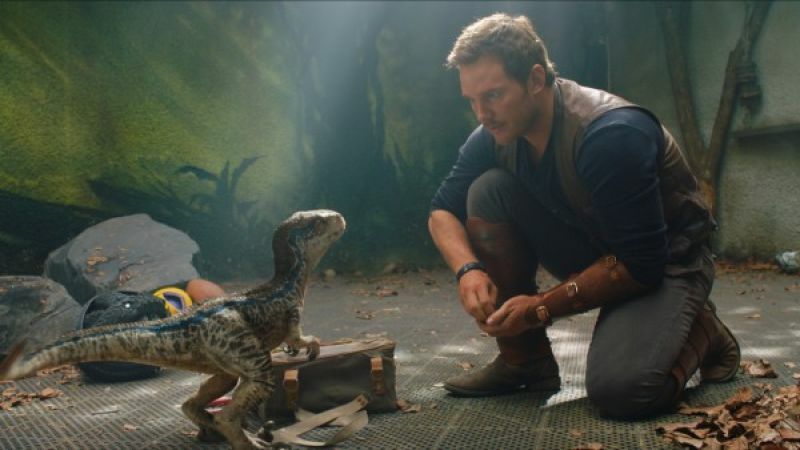 The ensemble cast that includes the charismatic Chris Pratt, Bryce Dallas Howard, and newcomer Isabella Sermon who plays Maisie Lockwood, are particularly fantastic. Chris Pratt and Bryce Dallas Howard retain the same charming chemistry needed for a good leading couple. There is also the show stealer Daniella Pineda who plays doctor Zia, a zesty member of Dinosaur Protection Group. The actors all bring something to the table that fits together nicely. Overall, keeping some weaknesses aside, 'Jurassic World: Fallen Kingdom' is a dazzling popcorn thriller. It's emotionally and visually exciting and has chills in many places. So, if you're looking to have a good time at the movies, this film definitely fits the bill. PS: Stick around during the end credits; you might crave for next installment to arrive sooner.